900 g kyllingfilet i mundrette bider. 300 g løg hakket fint. 1,5 spsk smør til at brune i.
Koges i 12 minutter og hviler i 12 minutter. Skær kyllingekødet i mundrette stykker. Brun dem i lidt fedtstof i en pande. Skær løget/ene i små tern, og tilsæt dem. Strø krydderierne (garam masala, cayennepeber, sukker og salt) over, og rør godt. Tilsæt de hakkede tomater og fløden og lad det hele småkoge ca. 10 minutter. Server evt. med ris og en nem salat. This post contains my initial draft of the racial templates for the Storytelling Birthright campaign setting. Physical Characteristics: 120-135 cm tall, 125-150 kg. Gray skin, stony and cold to the touch. Jet-black eyes. Hair and beard is black or dark gray, usually cropped short. +1 bonus to all Stamina rolls. -1 penalty to all Dexterity rolls, that involves running, jumping or other acrobatics. +1 bonus to Resistance rolls against magic. Dice Pool for Lifting/Moving Objects is 4 higher. Damage from crushing or bludgeoning attacks are halved. Infravision up to 30 meters. Rarely uses magic and not wizard magic at all. Physical Characteristics: 165-180 cm, 50-60 kg. Fair skin, Dark hair. Exquisite features. +1 bonus to all Dexterity and Wits rolls. -1 penalty to all Stamina and Strength rolls. Unaffected by aging attacks and normal diseases. All resistance rolls against Sleep and Charm Magical attacks are simple checks. Do not need sleep, but must rest quietly for at least 6 hours each day. Physical characteristics: Mostly as parent human, but with elven features mixed in, making them generally more ethereal and beautiful than their human kin. +1 bonus to all Dexterity rolls. -1 penalty to all Stamina rolls. Considered fully Sidhelien by the elves, but is generally mistrusted by humans. +2 bonus to resistance rolls against Sleep and Charm, Aging attacks and normal diseases. Physical characteristics: 100 – 120 cm, 20 – 30 kg. Resemble small humans. Usually slightly on the stocky side. +1 bonus to all Dexterity and Composure rolls. -2 penalty to all Strength rolls. +1 bonus to all Sling and thrown missile attacks. +1 bonus to resistance rolls against poison and magic. +1 bonus to surprise opponents. Can see into the Shadow World when concentrating for a turn. This will add a +2 bonus to rolls for detecting evil, detecting dead and detecting necromancy magic. Can Shadow Walk and Dimension Door 3 times a week in any combination. 3 extra dots to spend on skills at character creation. 1 extra dot to spent on merits at character creation. Cultural distinctions: Stubborn, proud, warlike. Social order is important. +1 bonus to all Will saves, Bluff rolls, Sense motive and Knowledge (Nobility). Cultural distinctions: The Brecht believe in free enterprise, sharp wits and nimble fingers. +1 bonus to initiative and to Reflex saves when wearing no armor or light armor. You also gain a +1 bonus to all Appraise checks. Cultural distinctions: Well-educated traders. Value the individual. Hospitality and conduct are more important than wealth. The Khinasi have no fear of magic. +1 bonus to all Diplomacy and Spellcraft checks. All knowledge skills are considered class skills for you at first level. Cultural distinctions: A wild and hardy people. From an early age they are taught a deep reverence and respect for the wilds. +1 bonus to all Fortitude saves, and have a +1 b onus to all Wilderness Lore checks in forests and hills. Wilderness Lore is considered a class skill for you at first level. You gain a +2 bonus to strength when determining carrying capacity or making a strength check, and a +1 bonus on all Wilderness Lore checks in cold wasteland or tundra. Intimidate is considered a class skill for you at first level. Select Attributes; All Attributes have a starting value of 1 dot. Divide 12 dots among the 9 attributes, The fifth dot costs two dots to purchase. Select Skills; Divide 22 dots among the skills. The fifth dot in any skill costs two dots to purchase. Select skill specialties; Select three skill specialties. Determine advantages; Defense (lowest of Dexterity or Wits), Health (Stamina + Size), Initiative (Dexterity + Composure), Morality (7), Size (5 for most humans), Speed (Strength + Dexterity + racial speed modifier), Willpower (Resolve + Composure) and Virtue / Vice. Select Merits; Spend 7 dots on Merits. The fifth dot costs two dots to purchase. I had a crazy idea a while back. How about adapting one of the greatest, IMHO, campaign settings in the history of AD&D to the Storytelling system? This post is the beginning of that work. Could be in several levels. Blooded could be a Merit as well. No classes of course, but a selection of professions that define preferred attributes/abilities etc. for typical professions: Wizard, Cleric, Paladin etc. Magic system inspired by the Freeform system in Trinity Players Guide. As I have written before I have a passion for programming. This is also my work, and one of the things I have learned during my 15 years is that if you do not specify what you are going to do, you will end up with something else than what you intended. So for the sake of myself, and to document the journey, I will use this blog to document my work with my app for aiding in roleplaying: RoleplayingAid. One thing that is important it to realize how the application should look, this is very important as it is what the users will see. They don’t care how well written or fast an application is, if it looks like something the cat dragged in. So, before I even begin to code, I will visualize the various pages I need in the app. 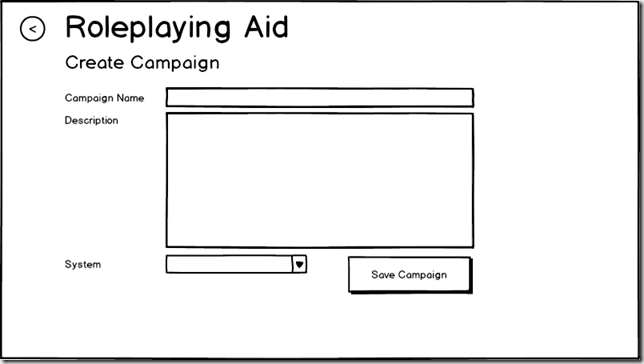 I am using a tool called Balsamiq Mockups for this. This tool allows me to quickly sketch how I want the pages to look, how the pages should relate, and so on. First I have a site map, this is usually something that is used with website, but the way WinRT apps are organized is very reminiscent of website, so it actually makes sense to use with these kind of apps. 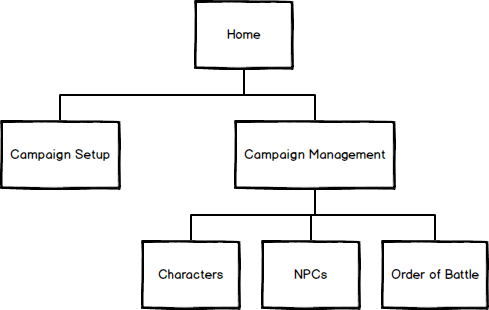 Now, from this we can see that we need at least three pages: Home, Campaign Setup and Campaign management. 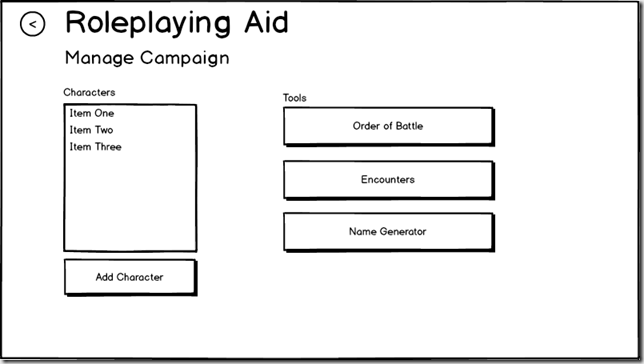 We may need separate pages for Characters, NPCs and Order of Battle as well. Now let us mock the pages. First, the start page, or Home, as it is called in the site map. The thing about WinRT apps, is that the interface should be fairly simple. The reason for this is that WinRT apps may also be used on tablets, and arguable, this is the primary target for WinRT apps. So, we will not clutter the page with a lot of options and controls, but we will keep it simple, so it is easy to use, even on a relatively small screen, as that on a tablet. The front page, or Home, will contain two buttons and a list. The list will contains all the campaigns currently available. Create Campaign page just contains a little information about the campaign, like a name, a description and the system used. 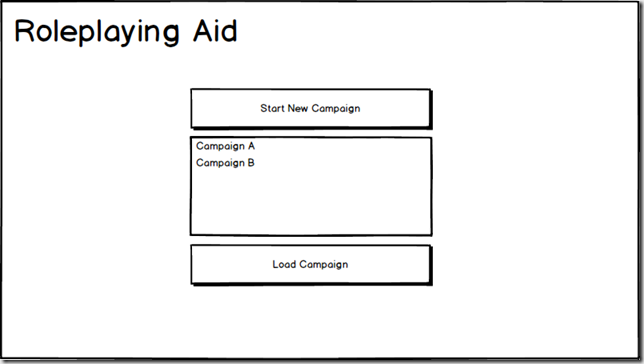 The Manage Campaign page contains a list of characters, and buttons or links to the functions/tools available. 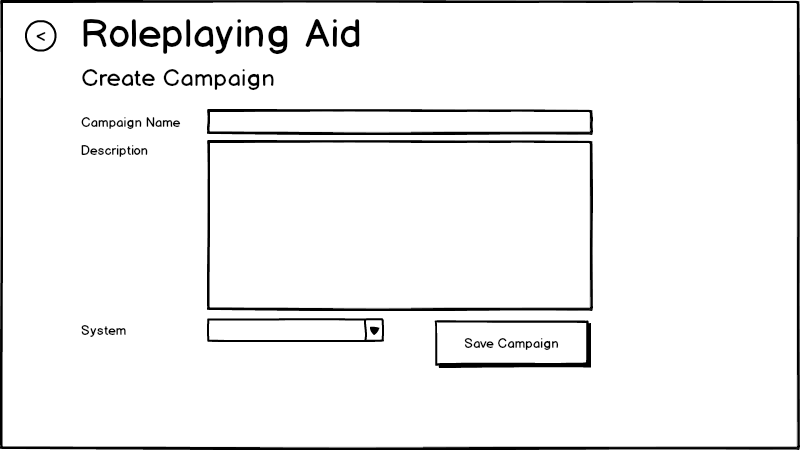 This is it for now, I have something to work from, and I will continue my updated on the RoleplayingAid app. I have been trying for some time to get the ball rolling on Windows RT apps. As a professional software developer, and as I am using all the rights tools in my daily work, this should be a fairly small step. However, the Windows RT programming paradigm is somewhat different from what I am used to, so this has proven to be a lot more work that I anticipated. Matters have, of course, been complicated by a lack of time and mental energy for starting something new up. And finally, finding the right project is a problem all of itself. I have been playing tabletop, or pen and paper, roleplaying games since high school. Life, however, has been preventing me for several years in enjoying this pass time, but I have decided that this should change now. So, I have my project, now to determine what I want it to do. 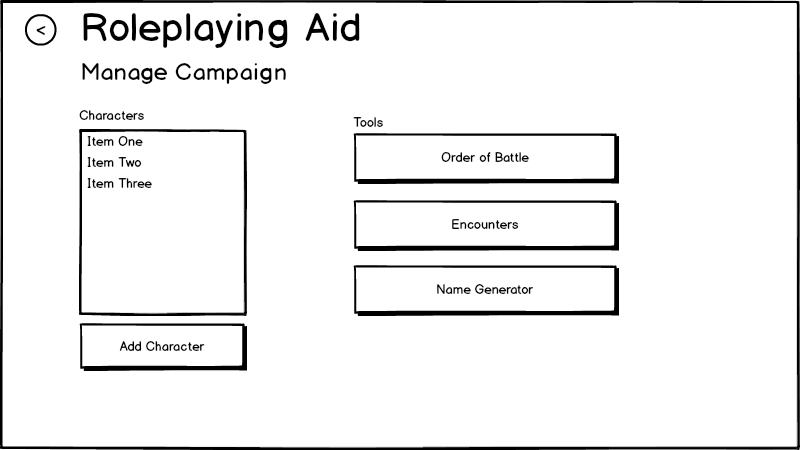 I want to make a tool to help me when I am heading a game, it should help with the more mundane and common tasks, like initiative, order of battle and so on. Some more tools, like a name generator, an encounter generator, a treasure generator etc. could all be considered down the line. First first, something simple, so I will go with a tool for managing initiative. Goal: It must be possible to manage several campaigns, so it won’t be necessary to enter all information every session. Goal: It must be possible to enter PCs and NPCs and rolling, or entering initiative. Goal: Order of battle, manage the initiative order, round by round. Monitor health. 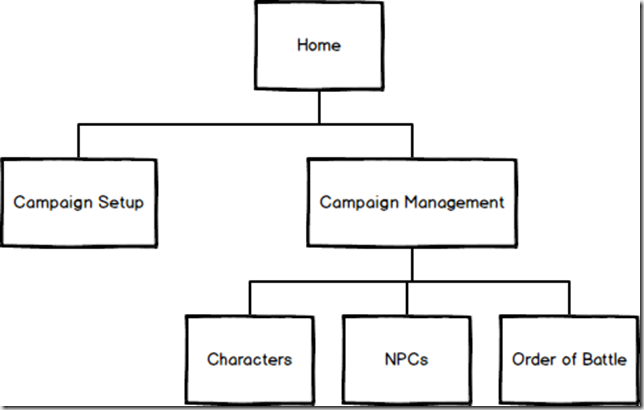 Architecture: It must be support multiple systems, like Storyteller / Storytelling, D&D. Architecture: If possible to WinRT apps, it must support a plugin model, so I can add new functionality and systems without having to recompile the whole thing. Goal: If not, then organize the app internally as if it supports plugins. Stretch goal: Tentativ support for Windows Phone as well. When these goals have been met, It should be ready for initial deployment to the store. Well, everything seems to be working as intended. This is my second or third attempt at setting up a blog. Not that I necessarily have that much to blog about, but I have a couple of passions that are suitable for blogging. Since I started playing at blogging, I have been using the BlogEngine.NET engine. This engine is fairly easy to setup and easy to use. My earlier attempts at blogging primarily stranded on me not having the time for it. Another, secondary problem, is that I had several instances of the blog engine running, one for my personal blog, one for a roleplaying game I ran, and a couple of others. All in all, I had 4 or 5 different instances running at one time, and every one of them ran on a different version of the blog engine. Now, however, BlogEngine.NET supports multiple blogs, and have for some time, and the need for so many blogs have been reduced, so now I am going to try again. I have two passions that I intend to blog about on this site: Computer Programming and Roleplaying Games.